When was the last time a product as commonplace as a tap or hand dryer made you stop and think, “Now that’s awesome…”? We experienced such a moment at the Dyson offices in Dubai, where we gathered to review the Airblade™ Wash+Dry. 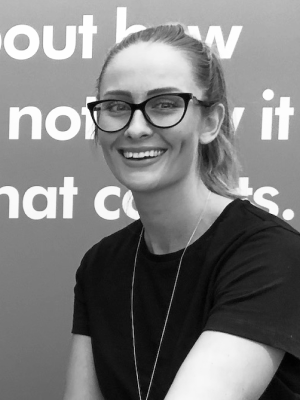 Joining us to give an expert opinion within an interior design context was Kristina Zanic, CEO of Kristina Zanic Design Consultants, and Kelly Tooze, Senior Interior Designer at Kinnersley Kent Design. 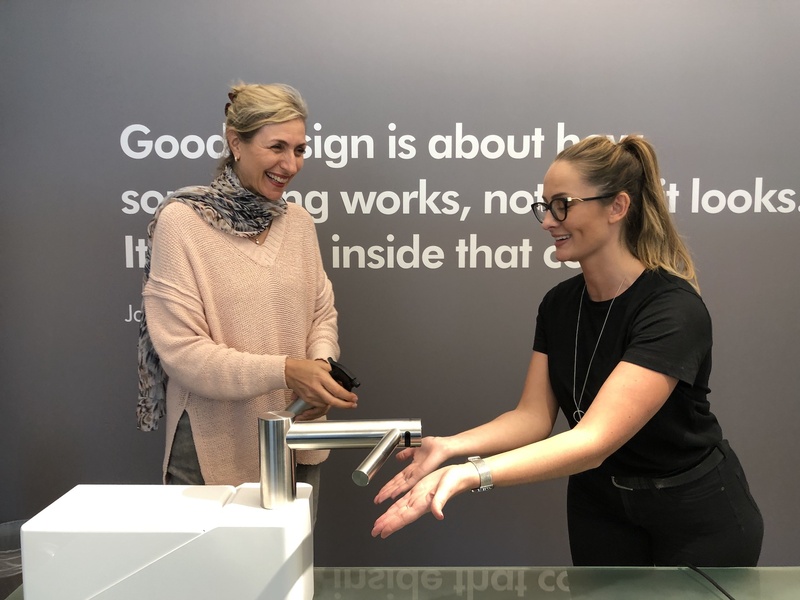 The Wash+Dry utilises the company’s Airblade™ technology, which is incorporated into a faucet system that, simply put, allows a user to wash and dry at the same spot. Two sets of infrared sensors can detect when you place your hands to wash, and to dry. It also eliminates the possibility of the faucet and dryer going off at the same time, which is truly clever. 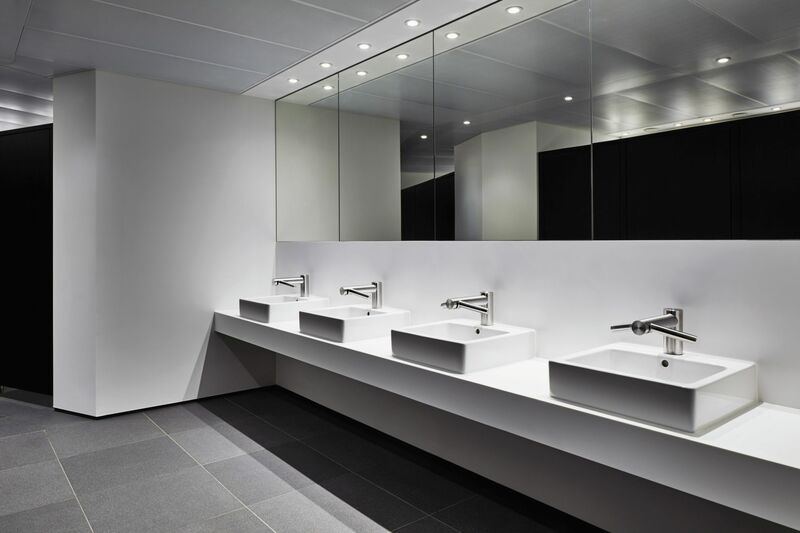 “Focusing on sustainable washroom design, we had three goals in mind – to minimise waste, and reduce energy and water consumption, while still achieving high standards of hygiene,” says Marc. Dyson’s Airblade™ Wash+Dry has certainly accomplished these feats, and by consolidating the washing and drying acts into one product and one location, there is already a positive environmental impact, i.e. saving space, and not having separate hand towel dispensers and hand dryers. “Where each square foot saved translates to huge savings on large projects, the Wash+Dry proves to be highly valuable,” says Marc. Our first reaction was a sense of wonderment. Such an obvious need was addressed so cleverly, yet no one thought to do this before. And even if it had been done before, it would surely not be quite to the level of quality that Dyson has accomplished. The very fact that you accomplish two primary tasks on the same spot, and in lesser time, comes with a host of advantages. For starters, no hand contact is needed with anything in the washroom (except, maybe, the doors), which ups the hygiene quotient. Then, the washing and drying in one spot avoids drips and consequently, wet floors. This eliminates the need for cleaning the washroom floors every couple of hours, and having to dispose off paper towels at least twice a day, thereby saving time and money. We particularly like the sleek, industrial look, even though it may not fit in a hospitality or luxury setting, but this too can be overlooked, given the environmental and financial return on investment. Kristina: Washroom design is all about functionality. People need to go in and out quickly, and this product helps make that happen. I love the fact that you don’t have to touch anything. Kelly: I love what you can do with this. It is also very project specific, in that its features apply mainly to public environments, such as hospitals, malls, schools, etc., and so it’s not for your standard consumer. But Dyson have got it sorted for the market they’re aiming for. 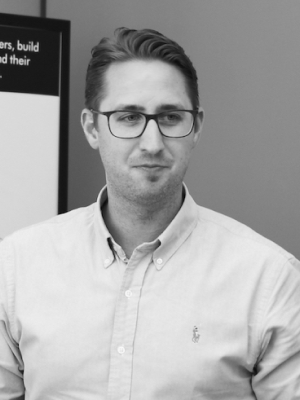 “We embrace the Life Cycle Assessment model (LCA),” says Marc. “In design, we look at a five year period”. He explains how Dyson views product value from a holistic standpoint, not simply an aesthetic one. The five year LCA helps the development team assess the environmental impact of their proposed product, and is the driving force behind many of the engineering and design choices that go into creating it. At the heart of the technology behind Wash+Dry, is the digital motor that powers the Airblade™. It uses digital impulses, using far less energy. The motor spins at 100,000 RPM vs 30,000 RPM of a standard motor, giving you that high speed air blade that is able to dry hands so quickly. The speed of air shooting out of the latest Dyson dryer clocks at 341 mph, as compared to 200 mph in conventional dryers. On the hygiene front, it is important to debunk the myth that recycled bathroom air is simply being pushed onto your hands, germs et al. The air stream output from the Wash+Dry’s dryer is passed through a HEPA filter – standard on the Dyson Airblade, which removes 99.95 percent of particles. The filtered air is then forced through apertures 0.55 mm wide, creating that ‘blade’ of air that almost scrapes the water off your hands. “Furthermore, the new version is at least 39 percent quieter! And has been certified by the Quiet Mark” says Marc on the feedback received of the noise levels of the predecessor AirbladeTM Tap model. Kristina: It’s got a strong industrial yet sleek aesthetic, which usually would not work in all settings but there’s certainly an application for it. The product is well designed so I see it working itself into larger projects for sure. For me, the fact that you can avoid those dripping hands and wet floors, is hugely compelling. There are so many avenues for application, from healthcare to schools, all locations where the spread of germs or possible injury is a cause for concern, especially with little children running around. 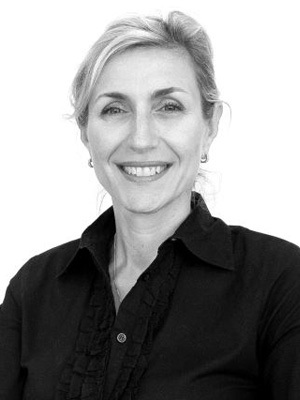 Kelly: I like its contemporary, innovative design, although I feel that it could be refined further still. I personally prefer the wall mounted version, saving more space. And I would definitely specify this in high foot traffic areas, such as malls or schools. No wet floors would mean so much time and money saved, maintenance wise. “Our goal at Dyson, is to use technology to create wonderful products, so people aren’t forced to compromise,” says Marc. The compromise Marc speaks of is the choice between saving on cost, or being environmentally friendly. Given the number of trees it takes to produce paper towels, there are significant, obvious improvements to using the Wash+Dry. It produces up to 79 percent less carbon emissions as compared to other hand dryers and paper towels, which granted Dyson AirbladeTM the Carbon Trust label . Furthermore, it uses pressure as opposed to heat, to dry the hands. Warm air from conventional dryers is not necessarily a good thing, Marc explains, as bacteria multiplies much faster in the heat. Moreover, with the HEPA filter, the air rushing out from the dryer is guaranteed clean and you’re done in just 14 seconds. What Dyson has accomplished with the Airblade™ Wash+Dry is no small feat. The innovation behind the product is truly remarkable, and there are virtually no alternatives out there in the market. The savings on cost coupled with environmental benefits are worth considering, but the price point is still in the premium tier, and far above market average. And while the design is beautiful, it might not work in upscale projects that can afford its price but not accommodate its aesthetic. However, it does the job it was designed for near perfectly, and solves a whole bunch of problems in one go. 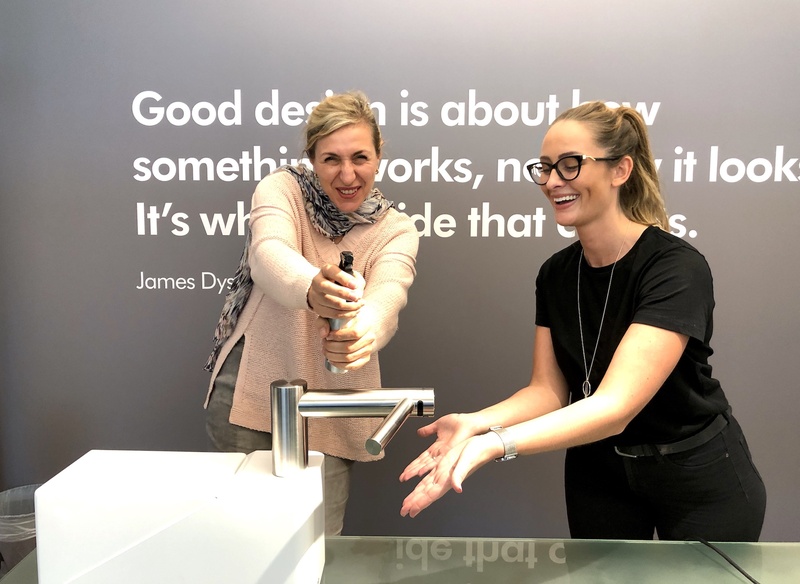 Kristina: Overall, I do believe this is a pretty phenomenal product, if you look at it as just a faucet and hand dryer. The warmth and high pressure are comforting almost. However, even with reduced noise levels, it still might not work in luxury settings, and will have to stick with public environments. Also, while it is already quite commonplace to see this around Europe, in a place like the Middle East, it will have to work hard to catch on. Kelly: The fact that you can get the washing and drying done in one spot opens up opportunities to re-think washroom design. The reduction in noise is definitely a relief. I would use it in F&B projects for sure, but the price point would be a concern. Clients would have to be educated on all the salient and hidden benefits that come with the product, to be convinced of the ROI.